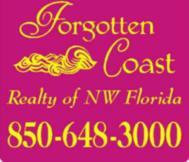 The goal of Forgotten Coast Realty of NW Florida is to provide excellent, professional and ethical real estate services to all customers. Our ultimate goal is attaining a satisfied real estate customer. We have been working with Carol for years and wouldn't consider another agent. Carol is knowledgeable and thorough in all her preparation. She knows the area and the market and provides valuable insight every time we look at property. Forgotten Coast Realty made purchasing property out of state easier than I ever dreamed it would be. Carol Erwin coached us patiently through the whole process and we were able to close within 30 days of our offer. She made our dream of owning a home near the Gulf a reality and we will always be thankful for her. While looking for an investment property in the Mexico Beach area on short notice, we called numerous realtors and Carol was the only one that asked us "What can I do to help you?" Carol listened to our needs and showed us multiple properties that exceeded our expectations. No high pressure tactics or trying to sell us something she wanted to sell. Being from out of state our visits were usually on short notice yet Carol always managed to greet us with that big smile and a well prepared schedule of homes to look at. Our closing was quick and flawless. We highly recommend her as we were extremely pleased with her negotiations and professionalism.